"I loathe people anchored in the present." Here's a movie for those of us who want to throw things at the television screen during Christmas week, who know that the saccharine, happy families in countless Very Special Episodes don't look anything like the people sitting around the living room who are related to you. 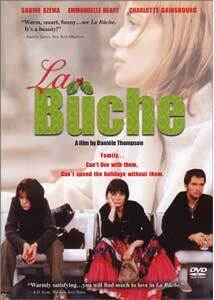 La Bûche succeeds where an American movie like Home For The Holidays comes up a little short, and while it's hard not to draw comparisons to Hannah and Her Sisters, which treads on similar emotional territory, La Bûche may be ambling, but it would be unfair to say that it's derivative. You'd better like these characters, or at least find them interesting, because that's what the movie has to offer, and generally it does a pretty good job of sustaining our attention. Just a few days before Christmas, and Mom's second husband has died—after an opening montage of Christmas trees and ornaments set to an overly perky version of Jingle Bells, the film begins with a funeral. Yvette (Françoise Fabian) is of course devastated by the death of her husband, and rallying to her are her three daughters from her first marriage. How the extended clan deals with grief, revelations of ancient family secrets and the playing out of long-held grudges over the days leading up to the holiday is the bulk of the movie. Louba (Sabine Azéma) at 42 is the oldest of the sisters—she's an entertainer at a Russian nightclub, who finds that she's pregnant. The father is Gilbert (Jean-Pierre Darroussin), the married man with whom she's been carrying on an affair for twelve years now. (He keeps promising to leave his wife when the kids are out of the house, but that's not going to be any time soon, as his wife is pregnant, too.) The middle child is Sonia, the Martha Stewart sister, who wants Christmas, and everything else in her life, to be just so—of course it isn't, as her marriage is falling apart, and she seems happy to start sorting through the shards of the emotional rubble. (Emmanuelle Béart, always so lovely, does great work here. You'd want to eat her perfectly prepared holiday feast, but then you'd want to get the hell out of there as quickly as possible.) The youngest is Milla, played wryly by Charlotte Gainsbourg, who seems professionally the most ambitious of the three, but also the one harboring the most psychological baggage. (Her prescriptions for the human condition are cheery aphorisms like, "People should take turns suffering.") Looming large for the sisters is their father, Stanislas (Claude Rich), who hasn't seen his ex-wife in something like twenty-five years, despite the fact that they're both deeply connected to their girls. The soundtrack is nearly wallpapered with American recordings of Christmas songs, and Thompson displays a particular fondness for Dean Martin, whose syrupy renditions of songs like I'll Be Home For Christmas provide a nice aural counterpoint to the family recriminations on screen. Image Transfer Review: Color levels are generally strong in this anamorphic transfer, though some pluming is evident, especially in the scenes shot at night. Black level is pretty solid throughout; it's a fairly satisfying movie visually, considering it's a writer's first time at the helm. Audio Transfer Review: The 5.1 track offers some extra ambience, in the more public settings especially�scenes set in markets and restaurants and such. But as it's a dialogue-driven movie (and it's in French), you'll find the stereo track a perfectly reasonable alternative. Extras Review: The featurette (04m:51s) is a brief interview with the director, in English; it's a pretty cursory look at the movie, with a couple of clips padding it out, but Thompson seems charming, and her English is excellent. The original French trailer is here, along with one produced for the U.S. video release; filmographies are for Thompson and the six leading actors. Weblinks are to a site for the director, and to another for Wellspring, and while the recipe for the Christmas cake looks delicious, it seems like a whole lot of trouble, too. La Bûche isn't going to replace It's A Wonderful Life as a holiday favorite any time soon, but in many ways the behavior in this movie is more recognizably human than that in Capra's. The fine French cast is good company for a couple of hours, and with just a few exceptions, they're well led by their director.